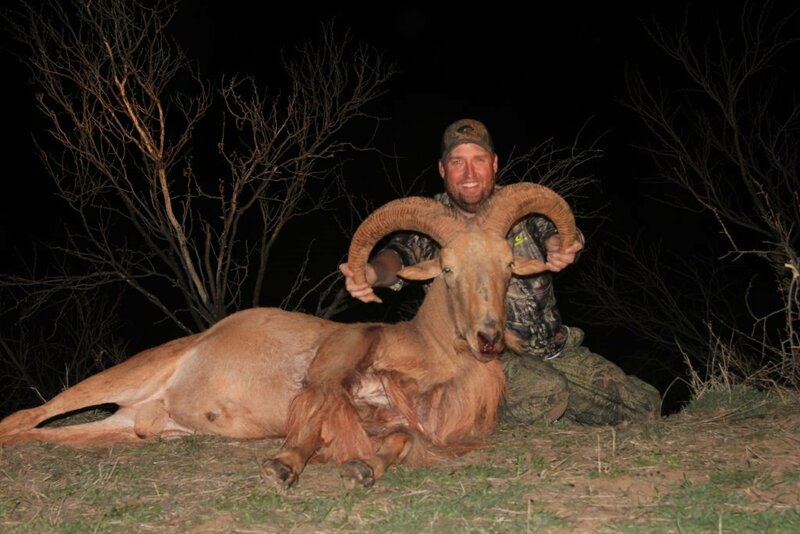 Ranger Creek Ranch is one of the few Ranches in West Texas that offer free-range Aoudad Sheep Hunting. Our ranches in Knox County are located on mesas surrounded by cedar breaks and 200 feet deep canyons. This is perfect habitat for the Aoudad Sheep which come out of the canyons during the winter to feed on the small grain field mesa. These Aoudad Sheep have very keen eyesight which makes it a very challenging hunt. The hunter may either hunt out of a blind or spot n stalk. At Ranger Creek Ranch, we have viewed Aoudad herds with animals numbering as large as 65 per group. Among these herd animals are several trophy-size and state record rams. Several aoudad that have been harvested on the ranch have scored in the SCI record book. The Ranger Creek Ranch Aoudad herd is heavily managed and only a select few Aoudad Hunts are offered each year. All inclusive Package includes 4 Nights of Lodging, meals, 3 Full Days of Guided Hunting $1250 per person plus a $2500 kill fee.